The Jerry Garcia Amphitheater was created in 1970 when the SF Recreation Department completed construction of a multi-purpose outdoor Greek-style amphitheater. The Amphitheater opened in 1971 and the press reports the amphitheater adds “a new cultural dimension to San Francisco” describing it as providing “excellent acoustics” & seating for 700. From 1975-77 3rd, 4th, 5th SF Blues Festival was held in the amphitheater until it outgrew the space and moves to the Golden Gate Park Band shell, then Kezar Stadium, then to Fort Mason until its final Blues Festival in 2008. From 1996-1999 SF Parks and Recreation expended capital funds to install ADA compliant restrooms, seating, parking spaces and pathways at the amphitheater. During the construction project amphitheater lighting and hillside stage electrical panels are removed. 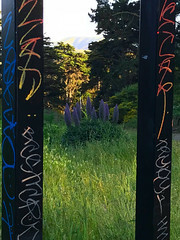 On July 21, 2005 Resolution Number 0507-003 passed by SF Recreation & Park Commission which proclaims the “unnamed Greek style amphitheater in John McLaren Park…shall hereinafter be known as the Jerry Garcia Amphitheater”. The Official City Dedication of the Jerry Garcia Amphitheater is held on October 29 2005 organized by Friends of McLaren Park, F.A.C.E. supported by District 10 & 11 community members, musicians and artists. Wavy Gravy is the celebration’s Master of Ceremonies, with an Official Proclamation presented by former Mayor (current Lieutenant Governor) Gavin Newsom with entertainment presented by The Jefferson Starship and several Grateful Dead Tribute Bands. 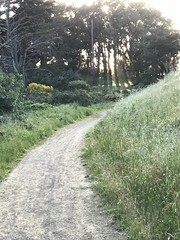 In 2015 McLaren Park Collaborative members voted to set aside 2012 Bond funds to repair the surface in front of the amphitheater stage and install a handrail on the path leading from the stage to the green room. Following the 2015 Grateful Dead “Fare Thee Well” Tour and SFRPD sponsored live-streaming concert in AT&T Park, the concert sponsor The Madison House donated $25,000 to SF Rec and Park to improve the Jerry Garcia Amphitheater. 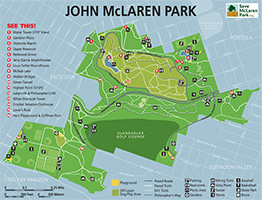 In 2016 SFRPD began the “McLaren Park Visioning Process,” starting with a day of family-friendly fun, a Treasure Hunt, designed for participants to discover several special places within the park. Future plans include a family triathlon and a soapbox derby. In 2017 SFRPD created four separate focus groups: Trails and Paths, Roadways, Jerry Garcia Amphitheater, and Group Picnic Area and Playground. In Summer/Fall 2018 RPD will hold meetings to discuss future improvements to update the Jerry Garcia Amphitheater and enhance the venue, based on community input from RPD Focus Groups held in 2017.